Google parent Alphabet Inc. (GOOG)(GOOGL) recently posted its fourth-quarter financial results. Although the company continues to enjoy spectacular growth in its search engine business, dramatically higher costs dragged down margins and free cash flow. By nearly any measure, the reported results were enviable. The company enjoyed robust growth in revenue of $39.3 billion, a 22% increase from last year's $32.3 billion, beating the consensus estimate of $38.9 billion. Warning! GuruFocus has detected 6 Warning Signs with MSFT. Click here to check it out. Alphabet's earnings per share of $12.77 bested Wall Street's consensus of $10.86. It is important to note, however, the earnings per share figure is higher than it otherwise would have been due to unrealized gains on company-owned securities, which added approximately $1.50 per share to net income. As such, the company expects earnings to rise by a modest 7% for 2019. Revenue for the company's ancillary businesses, which includes its foray into the cloud computing sector and the devices business, increased 38% to nearly $6.5 billion. The big drag on earnings were the costs associated with research and development for what the company characterizes as "Google Other," a rather nebulous profit-loss concept in an accounting sense, that represents an attempt to create the next big thing. Alphabet is tight-lipped about the overall progress of its ancillary unit, disclosing only in the words of Chief Financial Officer Ruth Porat: "We are investing across Other Bets commensurate with what we think is required." Alphabet is far behind cloud computing services giants Amazon (AMZN) and Microsoft (MSFT), necessitating recurring expenditures to build up the artificial intelligence and data service warehousing components of it cloud database unit. Traffic acquisition costs were $7.4 billion, versus $6.5 billion for the same period last year. 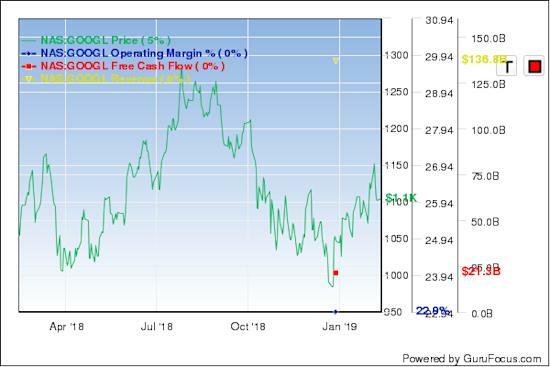 All the substantial increases in operating expenses noted above have hampered the company's current earnings power as well as created a drag on free cash flow, which came in slightly below analysts' expectations. As the chart below indicates, the big concern for investors is the decline of the company's operating margins. For the fourth quarter, Alphabet reported an operating margin of 21%, which fell below the Street's expectations of 22.1%, compared to an operating profit margin of 29.6% for the same period last year. As noted by GuruFocus, the company has two severe warning signs. First, Alphabet's operating margin has been in five-year decline. The average rate of decline per year is -2.3%. Alphabet's gross margin has been in long-term decline as well. The average rate of decline per year is -1.3%. While many companies would be quite pleased with even the reduction in Alphabet's reported margin, the fact that profitability is slowing is a cause of concern for analysts. Investors had a similar reaction when Amazon's latest results showed a deceleration in its rate of growth. What can investors expect going forward? Although it is difficult to assess the financial impact on the company with specificity, regulatory scrutiny, which has been uncharacteristically absent, will be applied with more vigor and will be more cumbersome. Few analysts appreciate that Alphabet's Google, like Facebook (FB), has had the unprecedented ability to conduct its business in a regulatory-free environment. Google has enjoyed doing business in this laissez-faire climate for the past decade. Given its $786.5 billion market capitalization, the company's ability to implement its business models with impunity is an unprecedented state of affairs in recent American corporate history. For Google, like Facebook, the no oversight, no-worry, regulatory-free party is over. Although it is difficult to discern its financial impact, it is going to have an indelible impact on revenue growth from its online advertising business. European regulators have been especially hard on Google. The company was recently fined $5 billion by the European Union for anti-trust violations regarding its Android mobile phone business. The company will continue to be in the cross-hairs of European regulators who are implementing enabling regulations that will be far more stringent than those the company may have initially anticipated. In a classic case of the law of unintended consequences, European regulators' initial attempts to impose regulatory privacy protection provisions on the company ended up driving smaller advertising tech firms from the business. Google enjoyed an enormous advantage in its ability to comply in a cost-efficient manner, while its tech advertising competitors were driven from the business. The Wall Street Journal reported that, in Europe, Google saw a 0.9% increase in the share of websites that include its advertising trackers two months after the General Data Protection Regulation went into effect compared with two months before, according to Cliqz, which makes antitracking tools for consumers. Facebook's share declined 6.7%. The share for the other top 50 online-ad businesses fell more than 20%. This situation undoubtedly will be redressed by European regulators. Germany has indicated it may issue regulations on valid anti-trust and anti-compettion grounds to specifically address Google's online advertising dominance in the market. American legislators are in early talks to potentially implement similar measures to constrain the company's unfettered and unrivaled power as well as the undue influence it exerts in the market. Google currently faces a dilemma. In order to diversify its business, it will need to continue spending heavily on research and development to create the next great thing, so as to wean itself off its principal revenue source. These expenditures will continue to act as a drag on operating margins and in light of the company's reticence to disclose operating results from its shoot-for-the-moon "Other bets division," investors will be left guessing whether these investments have been profitable or will continue to adversely impact earnings growth. Disclosure: I have no position in any of the securities referenced in this article. Does True North Commercial Real Estate Investment Trust's (TSE:TNT.UN) Share Price Gain of 16% Match Its Business Performance?